ad hominem attack | Dare I Call These People Alarmists? I’m very surprised that you spammed my comment and video. I read that your husband is an academic, although I don’t know which discipline. However I’m also surprised that you are prepared to take the IPCC at face value. 5. The IPCC has not successfully explained away the Medieval Warm Period, the Roman Warm Period nor the Holocene Maximum all of which occurred before there was any possibility of anthropogenic CO2. 6. Finally the remedies suggested by the IPCC and others including the Club of Rome and others will simply kill most of the world’s population including your children and mine. I think that’s an extremely high price to pay for an unproven notion, don’t you? I was around during this time, and these guys were absolutely serious. I mean that’s Leonard Nimoy of Star Trek fame narrating. Time magazine did articles and covers and the skiing was great. Anyway I understand that comments like this shake your faith and its difficult to shake these things off, even if it is likely to starve you and your children. But in spite of that, a good academic should answer such a comment as this with reasoned arguments, pointing to proper evidence and facts to support his views. I would expect no less. All of the above are on my website and more. FYI though, I have another site that I post blog pages on when bloggers cannot or refuse to answer my perfectly sane and logical questions and comments. Always with a URL to your blog of course. Needless to say, you are welcome to comment there as well because I never delete comments unless they are obscene or obvious spam. Anyway I hope you will have the strength to answer genuinely and logically here. Yes I did leave the video. I quite like it actually. Leonard Nimoy voice over and showing how scientists in the ’70’s cried wolf when there wasn’t even a sheep in sight. I even remember my superman comics having superman or some such hero fighting CO2 induce global cooling not to mention Time Magazine covers and so on. Well anyway I’m a little surprised to hear Rachel calling people contrarians and discussing how to get politicians to shoot us all in the foot to save the planet. Rachel this is over – the IPCC have lost the battle of credibility. Even Coast Radio news is warning about Climate Change myths. Even had the founder of Greenpeace giving a statement recently. In case you don’t know it, he clearly states that his organisation was hijacked, he doesn’t recognise it any more and he rightly says, (and he said it on Coast) that the proposed CO2 emission reductions “will kill us all”. All I really worry about nowadays is Agenda 21 which is taking a deep hold in my ruined city. So very true as well. I tried to comment further on Rachel’s blog, and although she allowed one comment for a little while, it looks like its spammed at the moment. Never mind Rachel, below is your whole blog with all the comments from your weak minded friends, none of whom, in common with you, have no real understanding of the Global Warming issue. Interestingly enough I even got some messages on my blog from people who had tried the to comment constructively on Rachel blog. It appears that all they got were ad hominems and deletions of their comment. Rachel, if you feel you have to spam comments that you do not agree with, and it is evident that you are not too sure about what you believe you are simply destroying your own credulity. Believe me, if you know you have the facts to support your beliefs, contrary opinions will not bother you. In fact it is not hard, when you have facts behind your belief, to point out where others errors are. Facts always speak for themselves, (once they have been explained), and it is not in the least stressful and you do not feel the need to call people names just because you disagree with them. Well below is Rachel’s blog with my comments which in the main were spammed. My comments and commentary below are in red. Please feel free to comment. My comment policy is publish and reply to everything I can and spam only comments with obscenities or are obviously irrelevant spam. The IPCC have produced a good video about the recently released report of IPCC Working Group I. It explains the physical science basis of climate change in a very simple manner. Think of it as climate science for dummies in 9 minutes. I have to thank Victor for bringing this to my attention. Victor is a climate scientist and his review of the video is that it is beautifully made with no obvious errors which is certainly good to know. Thank you, Victor! The release of this video has been accompanied by the usual criticism from contrarian voices. In particular, people have accused the video of being alarmist and policy prescriptive. On the first charge I will say that climate change is alarming. However, the charge of alarmist can only apply if the dangers are exaggerated and causing needless panic. Firstly, I don’t see anyone in a panic about climate change – although possibly we should be – and secondly, if we accept that the video is accurate then it follows that it is not alarmist. If anything, I felt that the scientists who were videoed discussing observations, like sea level rise, all looked a bit blasé about it. I think what we really need here is a bit of healthy panic. The second charge – that the video is prescriptive – relates to Stoker’s assessment that limiting climate change requires substantial and sustained reductions in greenhouse gases. Some people think that scientists should not step into the debate about policy solutions to climate change. I disagree with this on two levels. Firstly, I don’t think it’s prescriptive at all and secondly, even if it was, I want the professional opinion of scientists on how best to limit climate change. They are the ones who understand the problem better than anyone else and quite frankly I don’t trust politicians to understand and communicate the problem let alone dream up possible solutions to it. It would be like getting a diagnosis from your doctor and then visiting your local MP for treatment suggestions. It just doesn’t work that way. What can we do about? Probably the most effective solution is to divest or encourage your institution to divest from fossil fuels. See gofossilfree.org for more information. Politicians aren’t going to make the tough decisions unless they think it’s what we want. Thanks, Bronwyn. Great article. I recently watched the movie, Greedy Lying Bastards which looked at the stranglehold just a few fossil fuel interest groups had on politics. Sorry to keep changing my wordpress theme. I’m still not happy with it so there may be another change before I get it right. I always enjoy the new ‘looks’. The one you have at the moment is nice. I like the new typeface. And thanks for the reference to Greedy Lying Bastards. As if the fossil fuel industry wouldn’t be going all out to look after their interests. That’s good to know. I am particular about what I want from my wordpress theme and I just couldn’t quite get it right. I think this one ticks all the boxes. I’m planning to offer my copy of Greedy Lying Bastards on my blog for anyone who is interested but probably only to people in the UK or Europe, sorry. You might be able to download a digital version from Amazon. I agree wholeheartedly. Only science can direct a way foreward, and there needs to be a greater sense of urgency. Any other approach is bound to fail and the consequences very lasting. I’m very happy to hear you say so, Graham. It seems crazy to me that scientists should be asked to communicate the problem but then remain mute on solutions. Aside from the fact that it is their democrat right to have an interest in political decisions, we also need them to tell us which solutions are going to be effective and which aren’t. I do not fully agree with this. Politicians are the specialists for changing society, scientists are not. In designing a climate change policy you have to compare dissimilar things with each other, scientists can only add up similar things. You have to build coalitions to get policy passed, that is the daily work of politicians, scientists do not do that more than any average person. Scientists do have a role in the public debate, the main one is probably making sure that people do not sprout nonsense. That is probably the main reason, why those sprouting nonsense would like scientists to shut up. Scientists can also try to estimate the consequences of certain policy options, but how to add up morbidity, mortality, wealth, changes in power between groups, etc. that is up to society and politicians. Scientists are also part of society and thus also have the right to talk about policy. Some are even quite well informed about policy (but not all) and it would be stupid to exclude them and revoke their freedom of speech. But the specialist in this case would be the politician. Another thought during the weekend. Do you think you could appify the WG1 report? As alternative to the ClimateGate app. I probably largely agree with you here, Victor. I’m not saying that politicians should be absent from the climate change solution discussion. They need to be a big part of it of course, but I do think that scientists, not just climate scientists either, need to be here too. Otherwise we could end up with a situation where say, scientist describes the problem -> politician implements a solution without discussing with scientist whether it will work -> solution doesn’t work. This is essentially what it happening now. We’ve got politicians making feeble attempts at solving the problem but nothing effective has actually happened. Scientists need to be in on this decision making process to make observations about whether the solutions are going to be effective. As for appifying the WG1 report, I most certainly could. What are you thinking? The report in it’s entirety in an app? When it comes to adaptation, the collaboration between politics and science more or less works that way. That is the relatively easy case, with local costs and benefits. Mitigation is the difficult part. And the difficulties are mainly political in nature. No idea how such an app would like, you are the expert. It would likely be a bit like a book, but lighter to take with you while travelling. You could include a dictionary for the difficult terms. Maybe some of the figures could be customized and e.g. display the situation in your country? Have you seen it? It’s a climate change denying app. Such apps probably make more more. Just like WUWT has more readers as RealClimate. People prefer controversy over solid boring information. I agree with you Rachel, maybe this old world we all live in could use some panic about the whole issue of climate change. Yes, I’ve decided my catchphrase is “Start panicking and freak out!”. I agree with Victor’s sentiments that it is up to politicians to make societal changes, not scientists. That is what they are there for. The challenge is to elect politicians that are prepared to listen to what the scientists are saying. Most politics is centred around economics as it takes money to do stuff. Unfortunately, the dismal science has many competing ideas about how best to steer an economy and politicians will allow their own ideology to dictate which economists they will allow to advise them. The problem of implementing climate science policy is that the politicians try to apply the same formula and will ignore the overwhelming scientific consensus. If they are allowing their ideology to dictate which climate scientists to listen to they are going to run into a bunch of fringe nutcases or moneytakers. Personally I would like to see more scientists step into politicsand take their critical thinking skills with them. I’ve had a few thoughts about this and what you and Victor are saying about it being up to politicians to make societal changes. I think you both mean that it’s up to politicians to make and change policy rather than change society. Anyone can change society, right? Bill McKibben is changing society. Philosophers change society and the best example of this is probably Peter Singer. Journalists can change society by exposing corruption; teachers can change society by educating the next generation and so on. But in terms of making and changing policy, then yes, that is the job of politicians. And here I agree with you that politicians should be listening to scientists when it comes to making policy that depends on science and it would be nice if they listened to the mainstream view rather than some crackpot outlier. It would also be nice to see more scientists in politics but the personality characteristics that draw people to science are quite different to those that draw people to politics. If politicians represented only their constituents rather than party and it’s affiliations, then perhaps we could trust them. If politicians had dealt with the environment before now, then perhaps we could trust them. The world is ruled too much by those who can only talk a good game. The worlds hope is it’s increasing scepticism of the plausibly articulate. The only sane policy, with this issue, is get the job done now. The only sane instruction coming from those who know how. Your last sentence Graham is what I think I’ve been trying to unsuccessfully say. Politicians don’t know how to solve the problem. This is why we need scientists involved in the solutions to this problem and not just the understanding of it. They are the ones who know how to solve it. You were not unsuccessful. Sometimes it is the listener who fails. I hope you get the problem sorted. I always feel like I’m missing a limb when my internet connection goes awry. ukiss, Some scientists have solutions to climate change and I’m thinking James Hansen here. He advocates a carbon tax and nuclear power. He, and other climate scientists can assess things like how much CO2 we can still emit and what solutions will be effective for keeping within that budget. Politicians can’t do that unless they take heed of what the scientists are saying but they’re not. I realise the solution will involve more than just climate scientists though. They will be economists, philosophers, ecologists and probably many others also involved. As for running as an independent, why don’t you give it another go? There are lots of examples of politicians becoming successful later in life after earlier defeats. I’ll let this comment stand but all further comments are going through moderation and I’m not going to tolerate any that are not based in fact and science. Your video about scientists predicting an ice age in the 1970s is a myth. There were a handful of scientists who wrote papers saying this but the vast majority of papers on the topic were in prediction of global warming. Scientists cannot be held accountable for what journalists at the time chose to write in a magazine. I deleted your last posting of the ice age video because I’ve already pointed this myth to people like yourself numerous times and I’m getting tired of doing so. And if you’re after proof of climate change without the IPCC and without computer models, then I suggest you watch this video, which provides ample evidence without the need for either. And as for your assertion that the IPCC and others will kill off the world’s population. That is completely absurd, alarmist and extreme and possibly also a bit paranoid. I was going to give a point by point rebuttal to his absurd nonsense but quite frankly I am tired of these people who think that a first semester course in statistics somehow qualifies them to criticise actual experts. If Roger really thinks he knows what he is talking about, he is free to submit a manuscript to a sceintific journal in a relevant field and see how he goes. My guess is he would spout about peer review being corrupt and blah blah blah. It’s moronicand insulting to those of us who actually are working sicentists with peer reviewed publications. ukiss, I’m glad you didn’t waste your time. The only reason I decided to reply was for the sake of other people reading this who may have found Roger’s comment confusing. And Roger, the other reason your first comment got deleted when you made it last week was because you made it three times on three different threads! If that’s not spamming then what is it? A very interesting video, its just a pity that there are no references on most of his key graphs. Without these key references this video is not reliable. Maybe you can find these for us all. He didn’t even explain why there was a global cooling scare in the 70′s which by the way, did happen because you see I was there. But what about YOUR academic refutation of my assertions above? I’m also waiting for uknowispeaksense’s point by point refutations .Now I would find that interesting. I hope he/she has at least studied first year stats. company cannot operate? Do you think green jobs, which are another name for government subsidized employment, will fix that? Perhaps hubby is an academic in economics, why don’t you ask him what would happen if the price of transport goes through the roof? Of course if you believe in 100%socialism aka communism you may think that would take care of things. Ever studied the mortality record of the past experiments of that system? If anyone is interested in the references for Peter Hadfield’s video, he’s produced a video which contains all of them. Well at least I was able to find a reference for the most important graph in Rachel’s video see my unpublished reply below. Rachel, and that is why my comments policy is the way it is. Rachel, Oh dear, I see you have not published my earlier comments. That really is not friendly at all but thank you for the video which showed the references for that somewhat sensational video you published. It was quite difficult to find the reference for the graph at 7.10 on the video because the reference was not complete, but I managed to track it down anyway. According to the narrator, it was supposed to be a graph of CO2 and Earth temperatures with solar radiation some how factored in. When I found the reference it turned out that it was a graph of earth temperatures against oxygen isotope 18 used as a proxy. 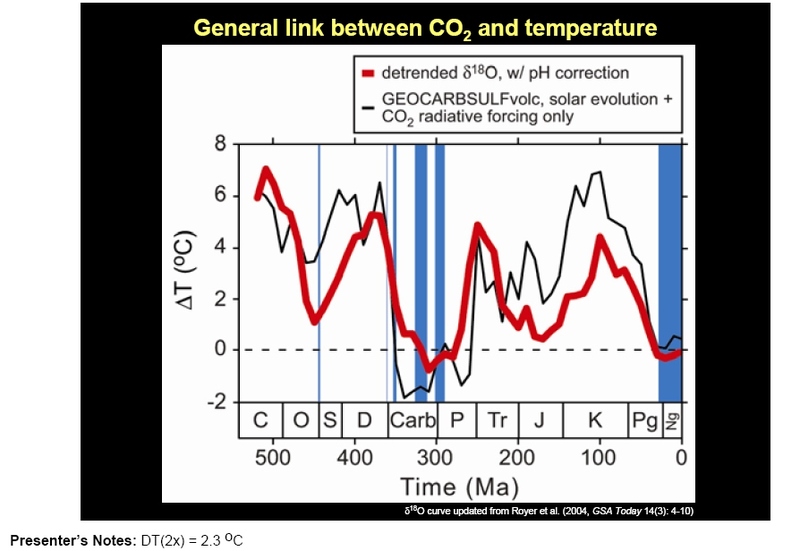 The paper did not elaborate that this was also a proxy of earth temperature at all and in fact the graph on the video was an adaption from another paper and it seems that the CO2 leading the Oxygen isotope was that adoption. Equally as misleading was the video narrators assertion that his evidence was computer model free, and that is a good sentiment, but when I read the base paper ie the one where the graph was adapted from-almost the first thing I read is the word ‘computer model’ etc. Just another little detail. This is a quite serious case of misleading the viewer, although it is possible that the maker of the video didn’t understand the graph either. Rachel you must really understand that believing without critical analysis is very dangerous in this IPCC dominated religion. That graph was the key point in the video and it seems to fail any critical review. Sorry. Oh by the way, this will all be published on my website at http://www.globalwarmingsupporter.wordpress.com along with your blog with all my comments to date. I’m sure as usual there are plenty who will view it and of course you are welcome to comment there too. Of course I may be just a little critical of your religious attitude. I hope your academic hubby is more rigorous in his approach. But you need to be careful what you publish on the net. I’m sure you are not a liar but you need to be sure of your facts and arguments. I’ve decided to publish your inflammatory comment, Roger, because you’ve said some things in it that I want to respond to. You said, When I found the reference it turned out that it was a graph of earth temperatures against oxygen isotope 18 used as a proxy. Paleoclimatologists use oxygen ratios from water trapped in glaciers as well as the oxygen absorbed in the shells of marine plants and animals to measure past temperatures and rainfall. In polar ice cores, the measurement is relatively simple: less heavy oxygen in the frozen water means that temperatures were cooler. Your second assertion that the video is misleading because it says it doesn’t rely on computer models is unjustified. No-where in that paper does it say “computer model”. Perhaps you can point it out to me because I can’t find it. Using proxies to infer past climates does not require a computer model. You are really nit-picking here anyway because Peter Hadfield uses just the one graph from that paper, a graph of CO2 and temperature, for which no computer models were required. The rest of your comment is insulting so I’m putting it in the public domain for people to read and judge for themselves. Well Rachel never published the above comment, or at least not for long. At least doesn’t show up for me unless I’m logged in to word press. I must admit I started to put a little pressure on. Rachel, I don’t care what the narrator says in your video, what is relevant are the academic papers behind that graph. If you want to gain any credibility, you really need to be able to discuss the base documents of anything you post on your blog. Although I warn your readers that the full script of comments including the ones that Rachel will not publish, will be on http://www.globalwarmingsupporter ax.wordpress.com within a few days. In actual fact, the graph in question does not appear in any academic paper. The point is that there never has been any debate about the correlation between global temperatures and CO2 in the atmosphere. The debate is about which causes what. If global temps move before CO2 levels then CO2 is a result of global temperature changes or vice versa. What the compiler of Rachel’s video is trying to tell his audience is that if CO2 leads or precedes global warming, then it is proof that CO2 has always caused global warming. Of course the converse is also true. If CO2 increases after rises in global temperature, then it is global warming which causes increases in atmospheric CO2. This is an interesting point with regards to proof. If CO2 precedes global warming it is possible, but not proven by any means, that CO2 is the cause of this particular rise in temperatures, but if the rise in CO2 is shown to be following the temperature rise, it is proof that CO2 cannot be the cause of global warming at least during the periods on the study. The compiler of Rachel’s video has made sure though that CO2 is leading the way and therefore CO2 is causing the global warming. Never mind that the axis are irrelevant – but it looks impressive for the few seconds you have time to take it in. The base reason that this graph was included in the video is obviously because the narrator wishes to make sure that the viewers are assured that CO2 preceeds Global Warming. There were a number of graphs but I this is the only one that sort of looked the same. Sorry its so small but you are welcome to use the link to see the original. Does it look like the graph in the video? I don’t think so, perhaps I have chosen the wrong graph, if so will a reader please correct me with an explanation? Actually the axis don’t even make relevant sense. Worse still if you read the publications and here they are, you will find 1. The paper is searching for a correlation between global temperatures and CO2 levels and DOES NOT claim to have shown that one CO2 precedes the other or vice versa. 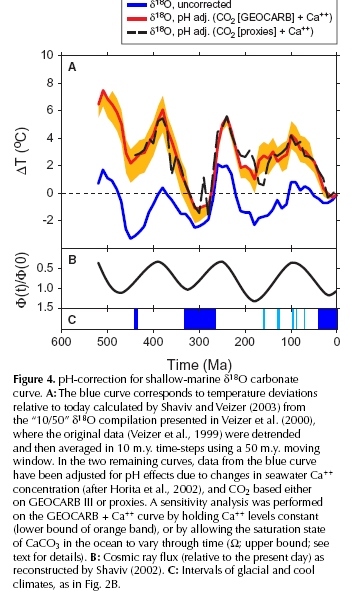 They do talk about CO2 being a “Driver” at all time scales, (in fact the title of the paper is “CO2 as a primary driver of Phanerzoic Climate”), but the paper is dealing in periods of millions of years(Ma). At that sort of resolution, considering that we told that CO2 is warming us up on an annual basis, any attempt to establish causation relevant to today is be laughable and the writers of the paper have sensibly avoided any such assertion. I have to add that, although it is a common practice, to include oneself in the references, is always a risky thing to do. For Rachel’s benefit, by my count, the word “model” appears 24 times in the paper, in my experience it is very difficult to model without a computer and suitable program.. If you are reading the paper, you may have found it difficult reading. Was it Einstein who said ” If you can’t explain it simply, you don’t understand it well enough”. Well Rachel, if she has any guts, and anyone for that matter, is welcome to comment here. I hope this exposes Rachel and her friends as simply being people driven by a blind faith in what they have been told, with very little ability to consider any statements critically. Who are these people who are influencing Rachel to think this way? Well let’s start with the IPCC and ICLEI shall we? If you wonder what ICLEI is, try going to your local government website and searching for the word. This is what Rachel and her cronies should read. All very well supported with careful references as well. The same should be said for every one who is promoting this political nonsense.